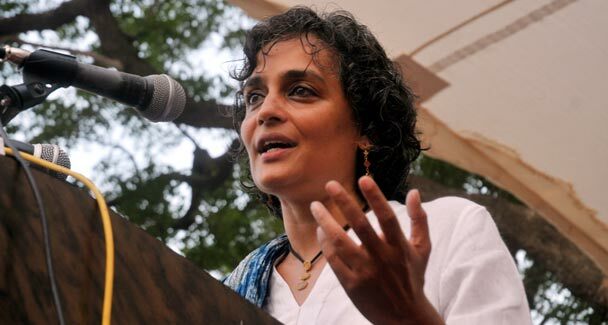 Indian writer and activist Arundhati Roy who has been canvassing for freedom of Jammu and Kashmir from years of military occupation said on Tuesday that far from seeking a break up of India, as alleged by her rightwing detractors, she fights for the love and pride of the people of India. The lack of outrage at the conclusion by Delhi police that there is “a fit case” to charge Kashmiri separatist leader Syed Ali Shah Geelani and author Arundhati Roy with sedition for what the two said in a seminar at Delhi is appalling. Only a few civil liberties advocates spoke out against the move. The opposition Bharatiya Janata Party openly bayed for their blood. Congress maintained a studied silence. The minor parties were just not bothered. Union law minister Veerappa Moily didn’t come out to well when he suggested that freedom of expression couldn’t’ be used to violate “patriotic sentiments”, whatever that means. The incident isn’t the best advertisement of either our democracy or our famed culture of tolerance. Sedition involves an attempt to overthrow legally constituted government. As far as I know, neither Geelani nor Roy did anything remotely in that direction. What they said was definitely against the government line on Kashmir. It was also against the popular opinion. Mercifully, there is no law that obligates us to toe the government or popular line. Going against it is dissent, not sedition; and democracies thrive on dissent. They do not shun it. Geelani’s views about Kashmir are well known. He has made no secret of them. Most other Indians do not agree with him and even find his views offensive. Yet, he is an Indian citizen and entitled to his individual liberties as much as any other. Freedom in a society is tested by its tolerance of what most of its members consider offensive. FREEDOM TO SAY GOODY-GOODY THINGS IS ACTUALLY NO FREEDOM. If we assert before the world that Kashmiris in India are living in freedom, it means even those Kashmiris who would rather not be part of India. They have as much right to air their opinion as the rest of us have to assert Kashmir is an integral part of India. If we find Geelani’s ideas offensive then let us come up with better ideas to counter them. I am never tired of recalling the historic 1989 ruling by the US Supreme Court upholding the right of American citizens to burn the national flag. Justice Anthony M Kennedy, who wrote a concurring opinion with the majority, put it so memorably, “It is poignant but fundamental that the flag protect those who hold it in contempt.” By so doing, the court added to the majesty of the American flag and the constitution, it did not imperil them. The same goes for Roy too. She holds strong views and expresses them forcefully. Too forcefully for many people’s comfort. Yet, her presence lends balance and a provocative edge to the discourse that would otherwise have been too one-sided. She raises uncomfortable, often troubling, questions. Of course, she does not provide all the answers. Sometimes her stance is contradictory and confusing. For instance, she herself uses airlines and railways but the development model she recommends would deny these to most others. If we are to build more airports, planes, and railways then land, steel, and aluminium for them have to come from somewhere. That would require some people to be displaced. One cannot be totally against displacement and still enjoy these facilities for oneself. However, her views are not the point. The point is her ability to say it in the manner she chooses. Of course, the moment she picks up a gun or begins to organize an army to overthrow the constitutional authority, she can be booked and restrained. But if she merely argues-much to the discomfiture many, of course – that Indian state tramples upon its own citizens, that it is sold out to corporate interests, that each new mine is a huge conspiracy to dispossess the poor and the defenceless, then she has to be countered with better arguments that it is not so. Threatening her with court cases actually proves her point. In any case, presence of people like her or Medha Patkar ensures that the debate is well rounded and all voices are heard. It may not stop the development but it at least would ensure better compensation and rehabilitation package for the displaced. That way, she is also being patriotic. When she challenges our ideas on Kashmir, does she not force a thought about where things have gone wrong and how we may right them? That also is a patriotic act. Now, should Mr Moily be booked because he violates this sentiment? In the end, it is not about Geelani or Roy. It is about our own idea of India. It is sad that police even in national capital cannot differentiate between an act of rebellion and a contrary opinion. It is sadder that the entire political establishment remains silent when citizens are threatened with criminal charges for voicing opinions-howsoever unpopular or offensive. This is only to be expected at a time when books are withdrawn from universities because some goon decides it is written in bad taste. IT IS TIME FOR US TO RISE AND TAKE THE MATTER OF OUR FREEDOM INTO OUR OWN HANDS. IF WE WON’T USE OUR LIBERTIES, SURE AS HELL WE WOULD LOSE THEM. The writer is deputy resident editor of The Times of India, Nagpur. In a career of nearly 30 years, he has reported on practically every beat. He is deeply interested in social and environmental issues and loves to travel, especially in wildlife rich forests of central India. Wonders of Pakistansupports freedom of expression and this commitment extends to our readers as well. Constraints however, apply in case of a violation of WoP Comments Policy. We also moderate hate speech, libel and gratuitous insults. The situation in Kashmir has been mainly polluted by the undue interference from across the border by an armed struggle against the democraticaly elected government at both centre and state in the past .This time with the change in international opinion and fragile condition of Pakistan the agents of terrorists have adopted an entirely different approach Tell me how many times A.Roy has tried to raise the grevances of Kashmiri youth before the young , dynamic , charming and intelligent friend of mine ,the son of Dr. Farooq Abdulla and present chief minister of Kashmir Mr. umar Abdulla ? I personaly support and same is the wish of rest of the world to convert the Land of Kashmir where flowers of different colours can bloom in coexistance .The efforts of Mr Alok facilitated by Mr H. Nayyer do not deserves my critisism but clarification and suggession that popular opinion also have some meaning that can not be ignored to make the article acceptable to the other side who has created a situation to which every one wants to encash in one way or the other except myself and few others .